Voila! What goes together better than Communism and Robots? That's right. Peanut butter and jelly. But OTHER than peanut butter and jelly, nothing goes together better than Communism and Robots! It just makes sense. Big Brother would be all over it! Especially ones this cute. 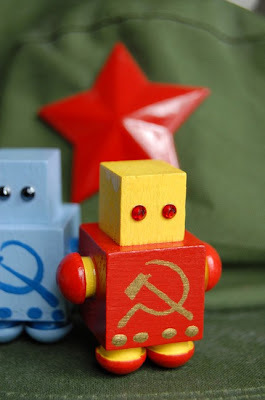 Check these commie bots out in the Etsy Shop! I am a creative spaz still trying to find my niche. I grew up in China and spent a total of 14 years of my life there. This gives me a different multi-cultural perspective on life and, of course, art. I do freelance art, tattoo design, and make handmade things. I am also a photographer. Be my friend.